For the first half of the 1990s they were the idols of the pop charts, with seven songs that went to number one, and record sales that outstripped everyone except the Beatles. They were the kings of music with the golden touch. They were a manufactured group, put together by producer Nigel Martin Smith, who’d seen the American success of a similar young group, New Kids on the Block, and wanted to emulate it in Britain – which happened to a greater extent than anyone could have imagined. Gary Barlow, Robbie Williams and Mark Owen had been members of a band called the Cutest Rush when they were contacted by Smith to join a new group he was forming. Along with two former members of Street Beat, Jason Orange and Howard Donald, they became Take That in 1990. Curiously, considering the young ages of the members, they were initially marketed to gay audiences, and after an independent single, Do What U Like, they were signed by a major label. However, their first records didn’t make much chart impact, as they continued to pursue the American R&B style, which was out of date for a British market enamoured of dance music. 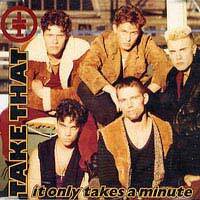 It was summer 1992 when the group scored its first major hit, their version of It Only Takes A Minute by Tavares, which peaked at number seven. That primed the pump for their first album, Take That and Party, which made the top ten in the album charts, followed by three more top ten singles and no less than seven Smash Hits Awards. The media loved them, and their next two singles, one of which featured ‘60s pop star Lulu, both went to number one, as did their sophomore album, Everything Changes, which entered the charts right at the top. By now they’d changed their sound to something more European, influenced by dance music, but with a strong sprinkling of ballads featuring Barlow, which appealed to older audiences, and which would set the template for all the similar groups to follow, like Westlife, A1 and Blue. One market they could never crack, though, was America. The records were released, but made no mark on a market dominated by home grown boy bands like N’Sync and the Backstreet Boys. Take That had enjoyed their time in the sun, but pop music has never been static – tastes change and move on. Although they’d become teenybop idols with a huge following among young girls (who’d become their prime audience after they’d forsaken the gay clubs), new things were stirring. The new Britpop, headed by the likes of Oasis and Blur, had emerged, guitar-driven rock that seemed to offer more meat than the vocal harmonies of the young group. The response came with the group’s third album, Nobody Else, which showed many changes within the band, too. Barlow was definitely front and centre, and Williams, who’d always had a wild streak, was hardly featured at all. But then, according to reports, he was already working on solo material, which meant it came as no surprise when he quit the band in 1995. The group itself imploded a year later. Ironically, as the band split, their single Back For Good had just begun to break in America. Gary Barlow, tipped to be the most successful following the break-down of Take That, went on to release a solo single, which was kept off the top of the British charts by the Spice Girls, another manufactured act formed to fill the vacuum left by Take That’s absence. However, in a curious twist of fate, the release of a Greatest Hits album in 2005 prompted a reunion of Take That in 2006 (without Williams), which proved far more successful than anyone had anticipated. Going back into the studio, they released the hit album Beautiful World and the number one single Patience.